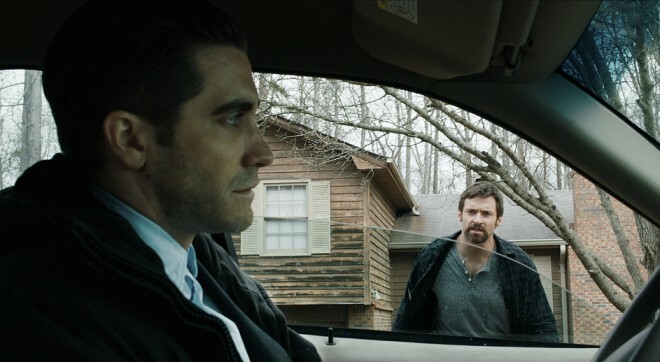 I started off my fairly light TIFF 2013 season this year with a film that was anything but light viewing – Denis Villeneuve’s Prisoners. At around 150 minutes long, it wasn’t exactly a movie that would ease me into the festival easily – but hey, at least the rainy weather matched the tone of the film. Villeneuve’s film is a thoroughly bleak, noir-esque thriller that tracks the actions of two Pennsylvania families, each dealing with the kidnapping of their youngest child. Hugh Jackman and Maria Bello are Keller and Grace Dover, who walk their teenage son and 7-year old daughter down a suburban street to the home of Nancy and Franklin Birch – played by Terrance Howard and Viola Davis – for Thanksgiving dinner. When the young daughters both disappear after venturing outside unattended, Detective Loki (Jake Gyllenhaal) steps in to lead the investigation. His biggest suspect is Alex Jones (Paul Dano), who owns an RV the children were last seen playing on. Jones gets let off early through a technicality though, and this spurs action – most specifically from Keller, who will stop at nothing to get his daughter back. 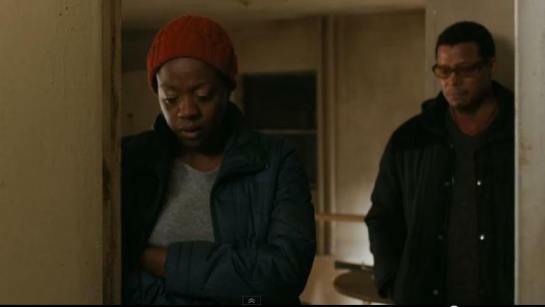 Those of you who have seen the trailers for Prisoners know where this is going, as many people have worried that the advertisements give away far too much of the plot. I had a similar worry when entering the theater, but now that I’ve seen the film I can tell you that there is much, much more to the story than the trailer presents. Yes, Aaron Guzikowski‘s script does delve into the lengths that these seemingly average family members will go to in order to find their children, but where this plot device takes the film is left largely uncovered in the promotional material. There’s a lot to delve into within Prisoners, with themes ranging from sin and spirituality, to vulnerability and of course prisoners – which there are multiple forms of at play here. I won’t get too deep into it, as I’m still sorting my own thoughts out on the film, but there’s certainly a lot to absorb and analyze, and I look forward to doing that. Hugh Jackman and Paul Dano put in the powerhouse performances that Prisoners hinges upon; Jackman’s Keller is prone to bursts of screen-peelingly intense dramatics that will leave you gobsmacked, while Paul Dano disappears into Alex Jones – lending a quiet brilliance to his mannerisms and tics. Gyllenhaal is no slouch here either, though while some may reach for Zodiac comparisons, his Loki is a different beast altogether. The supporting cast remains solid throughout – though some of Terrance Howard and Maria Bello’s individual scenes and dialogue didn’t land perfectly in my opinion. It’s also a shame that by the final reel, some minor issues arise; coincidences, fumbled plot minutiae and thriller clichés begin to rear their ugly heads. Especially odd is that the film’s opening half handles tiny, emotional details so perfectly, while the final act seems to bumble some smaller moments with borderline expository dialogue. Thankfully, Villeneuve’s expert hand at creating nail-bitingly tense scenes and the aforementioned performances really hold the entire picture together – stopping any of these issues from becoming a major hindrance. His knack for summoning up suspense and tension that you can feel in your gut is truly unmatched. When coupled with Roger Deakins’ incredible, pitch perfect cinematography, you have a thriller that will no doubt rank as one of the better pictures this year. I’m looking forward to revisiting it already, in hopes to sort through all the details and see if the picture continues to coalesce upon multiple views or if the minor problems I had will reveal themselves to be bigger issues.